Ofwat has today (31 January) published its initial assessment of water companies’ business plans for the 2019 price review, PR19. The regulator has taken a tough stance on all but three water companies and will push them to go further to deliver for customers between 2020 and 2025. Severn Trent, South West Water and United Utilities have all been “fast tracked” and given the green light so they can get started on delivering their plans for customers. Ofwat has placed Thames Water, Southern Water, Affinity Water and Hafren Dyfrdwy in the “significant scrutiny” category. 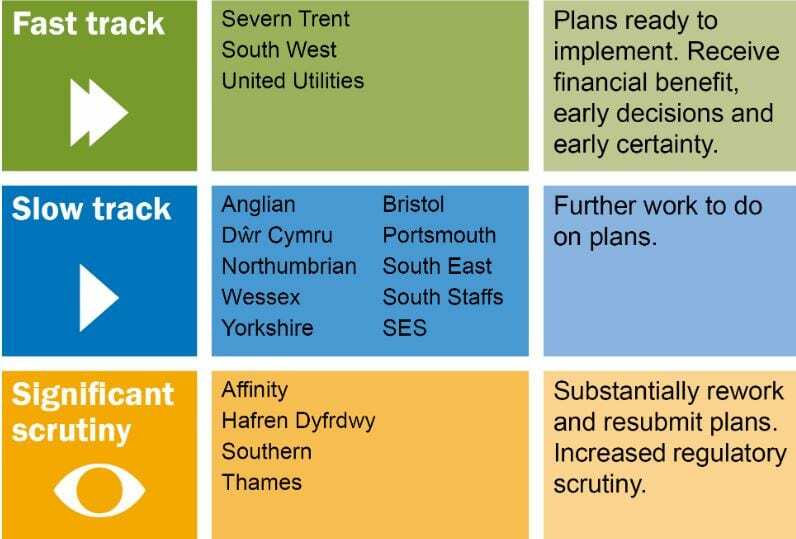 All other water companies have been placed in the “slow track” category: Anglian Water, Dŵr Cymru Welsh Water, Yorkshire Water, Northumbrian Water, Wessex Water, Bristol Water, Portsmouth Water, South East Water, SES Water and South Staffs Water. Ofwat: Rachel Fletcher, chief executive at Ofwat, said: “We have challenged all water companies to deliver more for less for customers over the next five years. “They’ve listened to the customers they serve. We’re seeing an increased focus on the things closest to people’s hearts such as keeping bills affordable, cutting leakage, protecting the environment and helping those most in need. “Three companies have already stepped up to the mark with high quality plans and stretching commitments to customers for the next five years. CCWater: The Consumer Council for Water (CCWater) has called for more ambition from water companies. Tony Smith, chief executive of CCWater, said: “We’ve not seen one plan that can be considered the finished article and there is still scope for improvement across the board, which we’re pleased Ofwat recognises. “Many companies have not stretched themselves on issues like reducing leakage and expanding support for customers in financial hardship. Water UK: Michael Roberts, chief executive of Water Uk, said: “Today’s announcement is not just about individual company plans, it is also about the sheer scale of collective ambition to do more for customers, the environment and the country as a whole. “The plans were created after seeking the views of five million customers to understand what’s most important to them. Taken together, those plans would mean a decade of falling bills, the most ambitious leakage programme in 20 years, and an expanded five-year investment programme of more than £50 billion. “There’s also a strong focus on helping the poorest and most vulnerable people in our society – we’re nearly doubling the help for people who struggle to pay their bills. Wildlife and the wider environment will benefit from the plans too, with 8,000km of rivers due to be improved, and the environment secretary recently said the plans showed that the water industry was making good progress. South West Water: Chris Loughlin, chief executive of Pennon Group, parent company of South West Water, said: “We’re encouraged that the regulator has a high regard for our business plan, particularly as it was shaped by our biggest ever consultation with customers. We are very grateful for the feedback we received. Severn Trent: Liv Garfield, chief executive of Severn Trent, said: “I’m pleased that Ofwat has recognised the progress made across the sector, and I’m personally delighted we’ve been given fast-track status for the first time, showing Ofwat shares our belief that customers will get the best possible outcome from our plans for the next AMP. It’s a great testament to everyone who was involved in pulling the plan together, especially to those customers who helped us create the proposals. United Utilities: Steve Mogford, chief executive of United Utilities, said:“We are pleased that our plan, which offers improved service and lower bills for customers, has been awarded fast track status. “We look forward to working constructively with Ofwat through to publication of the draft determination which, in line with the price review timetable for fast track companies, we expect to be published by Ofwat in early April 2019. “Ofwat has also published the results today of its annual company monitoring framework assessment which measures the quality and transparency of company reporting and the level of trust and confidence that customers and other stakeholders can place in it. SES Water: Anthony Ferrar, managing director at SES Water, said: “We are disappointed that our business plan has been given slow-track status. We believe it is a high-quality plan, developed with our customers to deliver their priorities at a fair price with bills lower in real terms than they are today. “We are pleased that Ofwat has recognised our commitment to ensuring our bills are affordable for all, along with their confidence in our ability to deliver our plan, based on our very successful track record. Wessex Water: Andy Pymer, managing director of Wessex Water, said: “We will be reviewing Ofwat’s initial assessment of our business plan and respond in due course. “We remain confident that our plan, which will see lower bills for customers and our largest ever investment to maintain and further improve services, delivers the very best outcomes for our customers and the environment. “It was particularly pleasing to hear that Ofwat liked our customer research and engagement, our approach on affordability and vulnerability and the use of innovation and markets. Bristol Water: Mel Karam, chief executive of Bristol Water, said: “This is a step forward for us and recognises the ambition we have shown in producing a great plan for our customers. “There is still work to do to fully understand the detail of the initial assessment and we will be working with Ofwat to further improve the plan before resubmitting in April. Anglian Water: Alex Plant, director of strategy and regulation at Anglian Water, said: “We are confident we submitted a strong plan, a plan that is based on the priorities of our customers. “Ofwat has commended us on many aspects of our plan, including the quality and depth of our half a million engagements with customers, which has been assessed as sector-leading. We have also been commended on the ambition of our proposals to support those in vulnerable circumstances. “However, Ofwat has set us some challenges around cost efficiency in particular. Welsh Water: Chris Jones, chief executive of Welsh Water, said: “Our business plan for 2020-2025 is an ambitious set of proposals which prioritises a combination of record £2.3 billion investment, alongside an average £22 reduction in customers’ bills and strong proposals on a range of customer priorities – including leakage reduction, supporting our most vulnerable customers, and protecting the environment around us. Portsmouth Water: Bob Taylor, chief executive of Portsmouth Water, said: “Whilst we are disappointed that our business plan has been given slow-track status by Ofwat we have confidence in the many high-quality aspects of the plan which will see customers’ bills reduce to an average of £97 from 2020 and staying at this level in real terms for the next five years – the lowest in the industry. “At the same time, we plan to further enhance our services to customers, maintain our key role in our communities and remain trusted custodians of the local environment we live and work in. Thames Water: Steve Robertson, chief executive of Thames Water, said: “Thames Water is disappointed with today’s announcement from Ofwat on our £11.7 billion five-year business plan, which is built on the feedback of nearly one million customers. We remain committed to our forward-looking plan, which prioritises investment over everything else – including shareholder dividends. “The plan includes significantly increased investment, to tackle issues that really matter to customers such as leakage, pollutions and resilience, while keeping average bills flat. It also supports job creation and regional economic growth and will deliver a four-fold rise in financial assistance to families in vulnerable circumstances. “We are seeking Ofwat’s permission to invest more in areas where we know it is needed. Instead, it appears that we are being asked to reduce our current levels of spending. We are concerned that this will make it harder to meet the needs and expectations of our customers, amid the challenges of population growth and climate change. “We’ll now study the feedback in detail and look forward to engaging constructively with Ofwat throughout this process. Southern Water: A spokesperson for the water company said: “Whilst we are disappointed with Ofwat’s initial categorisation of our plan as significant scrutiny without financial penalities, we will continue to work pro-actively with our regulator to understand their concerns and strengthen the actions already taken to address these issues. “Encouragingly, we have received positive feedback on our Water for Life plan from many of our customers and other key stakeholders which was developed following an extensive three-year consultation process. While reducing our customers’ bill by more than 3 per cent, we have outlined £4 billion of new investments, 25 per cent more than we have ever invested, of which more than £800 million is dedicated to environmental improvements. Affinity Water: Pauline Walsh, chief executive of Affinity Water, said: “We are surprised and disappointed by Ofwat’s initial assessment of our 2020-2025 business plan and look forward to discussing this with Ofwat in the coming weeks as part of this on-going process. “Our plan builds on the vision we committed to in our current 2015-2020 business plan to become the UK’s leading community focused water company.